Cherry Mobile Festival 2016, Launched! We Have Details on Giveaways, Promos, and Activities! For seven consecutive years now, Cherry Mobile Festival has been the most successful Pinoy handset maker's way of thanking its loyal partners, consumers, and fans for the support that they continuously give the brand. And this year, it's going to be a 2-month-long celebration filled with exciting giveaways online, generous freebies to buyers, and big discount promos at well as fun activities at CM stores and kiosks. TP Friends, today marks the first day of Cherry Mobile Festival 2016! 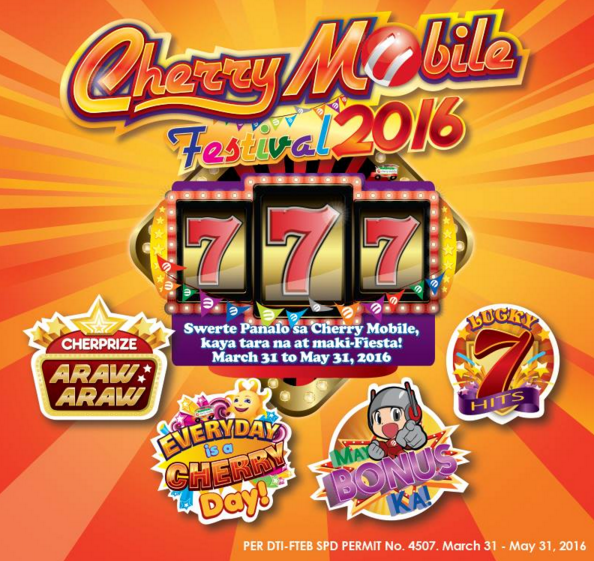 Dubbed as "777 Swerte, Panalo sa Cherry Mobile", this year's much-awaited CMF is set to bring big discounts and incredible surprises to every Filipino. "Cherry Mobile Festival has always been exciting since we launched it 7 years ago. But this year, Cherry Mobile ensures that customers will get more of what they have purchased on a daily basis, because we want them to feel that everyday is a Cherry day," shares Ms. Michelle Ngu, CM's Vice President, on what makes the celebration this 2016 even more special. • Lucky 7 Hits - Big and special discounts await the lucky customers at Cherry Mobile Concept Stores. Don’t miss on the announcement of the special dates and which participating outlet it will be held. • CherPrize Araw Araw - Php 3 million worth of prizes are up for grabs! 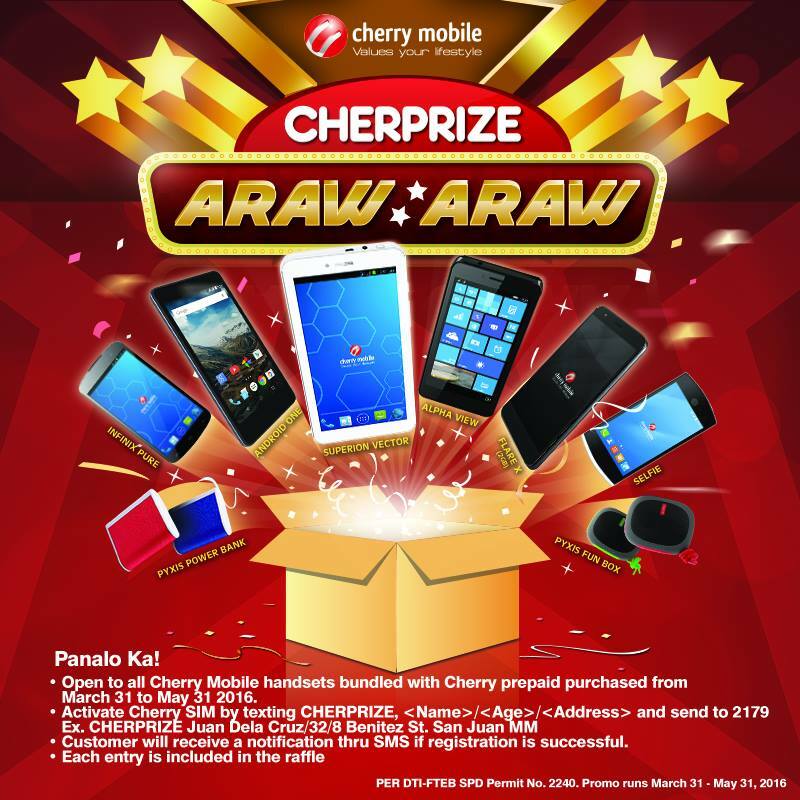 Cherprize Araw Araw promo is open to all Cherry Mobile smartphones bundled with Cherry Prepaid SIM purchased within the promo period, March 31 to May 31, 2016. Customers need activate their new Cherry Prepaid SIM and text the (keyword) CHERPRIZE, (Name)/(Age)/(Address) and send to 2179, within the promo period. Customer will receive a notification through SMS if registration is successful. • May Bonus Ka! - Lucky customers will get additional treats from Cherry Mobile when they avail of select Cherry Mobile Phones bundled with Cherry Prepaid SIM. • Everyday is a Cherry Day - Watch out for this year’s new Cherry Mobile campaign featuring the country’s hottest young loveteam: JaDine (James Reid and Nadine Lustre) plus Cherry Mobile’s latest jingle. • Barangay Cherry Mobile - Join fun games, raffles, and activities that will be held in various Cherry Mobile Concept Stores and Kiosks across the country. As a kick off, Cherry Mobile will be holding some in-store activities in their concept stores at SM Megamall and SM San Fernando on April 1, 2016 and subsequently on April 3, at Ali Mall Cubao, SM Dasmarinas and SM Clark Pampanga. Customers who will purchase any Cherry Mobile and Cherry Prepaid products will have a chance to win exciting prizes and enjoy big discounts. Make sure you don't miss out on any of these special treats from Cherry Mobile Featival 2016, starting on March 31 until May 31, 2016. And remember: Everyday is a Cherry day! See you at the stores, TP Friends!